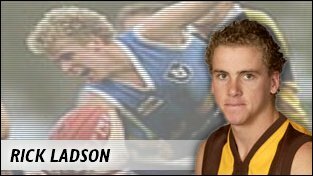 Selected at pick 16 in the 2001 National Draft, Ladson impressed early in 2002 with some strong showings in Hawthorn practice matches and at Box Hill. Disaster struck when Ladson injured his knee the day before he was to be selected for his senior debut; an injury that would keep him out of the game for most of the year. 2003 started brightly for Ladson, as he put together some good games at Box Hill and earned his long-awaited senior debut against Carlton. He showed an eye for a goal, booting five in his six matches before a shoulder injury derailed his season. It was another disappointing season in 2004 for Ladson, who suffered another series of injuries and failed to cement a spot in the senior side. In 2005, he seemed to be a first-choice player for Alastair Clarkson, but again injuries meant that Ladson couldn't establish himself in the team. Ladson finally established himself in 2006, playing every game off half-back and a wing, his good ball use and pace showing he has what it takes to play at the highest level. This good form continued in 2007, he consistency and good disposal making him an important cog in the Hawthorn line-up.